Digital Marketing Course in Hindi videos will cover Full Coverage of Email Marketing, Search engine optimization – SEO (ON/OFF Page), Social Media Marketing, E-commerce SEO, Google Adsense, WordPress, Pay Per Click (PPC) & more with use of PPTs and Live Examples. These videos are enough for a complete understanding of concept. • Course Content-Type: Video Lectures, Notes, Online Quiz, and Question Bank. • Course Content/Duration: 40 Hours of Video Lectures with the use of Live Case Study. Learn Digital Marketing course and have a chance to walk into a job and work like a pro from day one! In this training course, expert training provider takes you through the Beginner to Pro in Digital marketing course online in Hindi covering all the Advanced Study of Digital Marketing. In this training course, you will learn by watching the author actually perform the operation he is instructing on, as he explains step by step how to perform these functions. The trainer slowly works you up through learning the various capabilities of this very powerful program and covers topics such as basic to advanced formula and functions. • Over 81 lectures and 30 hours of content! 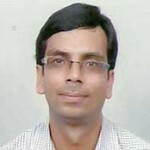 Sanjay Jain(B.Tech. IIT Roorkee, Digital Marketing and SEO Expert) is an excellent faculty having teaching experience of 10 years for Digital Marketing. His approach to teaching is structured and practical which allows the use of live examples in the class. He is famous among students for his unique teaching style.